Domestic mains water temperature data for 16WW on tap; seasonal min/max about 10C/20C in winter/summer. A data set of regular samples of domestic mains water infeed temperatures in suburban London (UK). Useful for estimating required temperature 'lift' and therefore energy demand for DHW (domestic hot water), washing machines and dishwashers ("wet white goods"), for example. The HTML table below is laid out to be easy to parse with text processing tools, eg to convert into CSV or load into a speadsheet, if required. 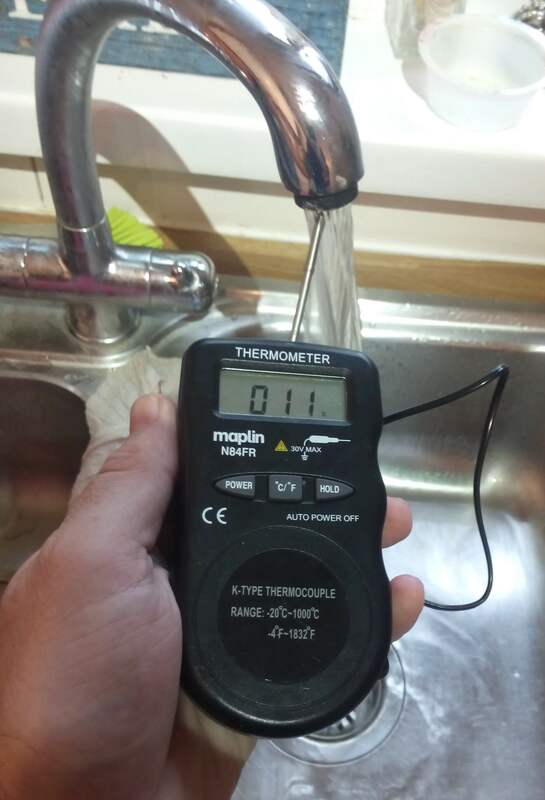 Water temperature is measured at the 16WW kitchen tap (which is close to the water main feed to the property) running a fast-flowing stream. The probe tip is placed up inside the tap nozzle with the tip not touching anything if possible. Typically upwards of 20s is allowed until the temperature reading settles before the value is recorded in the table below. The aim is to measure near (solar) noon where possible, and near the middle of each calendar month to be representative for that month. There are extra and missing samples though. This page is marked up with JSON-LD microdata to describe the data set. The temperature of water going to homes from reservoirs in the Thames Valley and London has dipped to a record low, officials have revealed. Thames Water said due to freezing weather water had cooled to a "staggeringly chilly" 1.8C. Until now the coldest water temperature recorded was 4.9C in 2001 - the average is 7.3C. 11°C 2012/01/15 13:20 UTC Temperature higher than previous even though outside temperatures have been much closer to freezing for several days. 10°C 2012/02/01 19:30 UTC Outside temperatures again around freezing for several days. 9°C 2012/02/08 09:00 UTC Outside temperatures again around freezing for several days. 22°C 2012/08/19 15:00 UTC Measurement taken by Ellie; alternating between 21 and 22. 11°C 2012/11/30 12:00 UTC Reading alternating between 11 and 12. Outside below freezing overnight. 10°C 2012/12/31 12:00 UTC ~11°C outside. 10°C 2013/01/06 18:13 UTC ~8°C outside. 10°C 2013/01/15 12:15 UTC ~2°C outside. 8°C 2013/02/15 11:52 UTC ~8°C outside and sunny. 9°C 2013/03/15 11:53 UTC ~7°C outside. 9°C 2013/04/05 17:42 UTC ~7°C outside; has been a very cold March. 10°C 2013/04/15 11:00 UTC ~14°C outside. 14°C 2013/05/15 13:00 UTC ~11°C outside. 16°C 2013/06/15 16:00 UTC ~16°C outside. 21°C 2013/07/15 13:15 UTC ~27°C outside. 22°C 2013/08/11 08:50 UTC ~17°C outside. 18°C 2013/09/15 11:05 UTC ~13°C outside. 16°C 2013/10/17 12:34 UTC ~16°C outside. 10°C 2013/11/15 18:53 UTC ~7°C outside. 11°C 2013/12/08 09:52 UTC ~7°C outside. 11°C 2013/12/15 11:47 UTC ~11°C outside. 12°C 2014/01/15 21:25 UTC ~10°C outside. 9°C 2014/02/15 12:00 UTC ~10°C outside. 11°C 2014/03/15 09:40 UTC ~10°C outside. 14°C 2014/04/14 12:00 UTC ~14°C outside. 16°C 2014/05/17 17:30 UTC ~22°C outside (BBC KT1 Weather; 23°C external sensor). 20°C 2014/07/14 11:50 UTC ~20°C outside (BBC KT1 Weather). 21°C 2014/08/15 10:53 UTC ~16°C outside (BBC KT1 Weather; 16.5°C external sensor). 20°C 2014/09/15 08:52 UTC ~15°C outside (BBC KT1 Weather; 15.5°C external sensor). 17°C 2014/10/14 12:30 UTC ~13°C outside. 14°C 2014/11/15 11:52 UTC ~10.5°C outside. 12°C 2014/12/15 12:00 UTC ~7°C outside. 10°C 2014/12/30 12:00 UTC ~0°C outside. 11°C 2015/01/15 12:00 UTC Reading flickering to 10°C briefly. ~8°C outside. 9°C 2015/02/15 11:15 UTC ~7°C outside. 10°C 2015/03/15 11:54 UTC ~6.5°C outside. 13°C 2015/04/15 06:30 UTC ~12°C outside. 16°C 2015/05/15 11:05 UTC ~14°C outside. 17°C 2015/06/15 11:05 UTC ~16°C outside. 21°C 2015/07/13 11:00 UTC ~19°C outside. 20°C 2015/08/01 17:40 UTC ~20°C outside. 21°C 2015/08/21 11:00 UTC ~22.5°C outside. 18°C 2017/10/15 11:00 UTC Reading flickered to 17°C briefly. ~16°C outside as measured by porch sensor, though BBC Weather for KT1 claims 18°C. 11°C 2018/01/15 18:30 UTC ~8°C outside; display flickering between 11 and 12. 9°C 2018/02/15 23:50 UTC ~5°C outside. 9°C 2018/03/15 12:00 UTC ~11°C outside. 13°C 2018/04/15 11:00 UTC ~13°C outside. 17°C 2018/05/13 12:05 UTC ~15°C outside. 16°C 2018/05/15 10:58 UTC ~21°C outside. 20°C 2018/06/15 11:00 UTC ~22°C outside. 24°C 2018/07/13 17:04 UTC ~24°C outside. 25°C 2018/07/15 10:58 UTC ~28°C outside. 25°C 2018/07/26 12:01 UTC ~32°C outside. 24°C 2018/08/02 12:29 UTC ~28°C outside. 23°C 2018/08/15 10:50 UTC ~22°C outside. Reading flickering to 22°C. 20°C 2018/09/15 10:56 UTC ~17°C outside. 19°C 2018/09/23 12:35 UTC ~11°C outside. 18°C 2018/10/15 10:56 UTC ~14°C outside. 14°C 2018/11/14 08:40 UTC ~11°C outside. 14°C 2018/11/15 12:00 UTC ~14°C outside. 12°C 2018/12/15 15:08 UTC ~3°C outside. 10°C 2018/01/15 11:52 UTC ~8°C outside. 9°C 2018/02/19 11:45 UTC ~9°C outside. 11°C 2018/03/16 12:02 UTC ~12°C outside. 12°C 2018/04/15 10:30 UTC ~12°C outside. First published 2010-09-12 , updated 2019-04-17 , rebuilt 2019-04-19 . Site copyright © 2007-2019 Damon Hart-Davis. Hosted by ExNet.